Lifeway Kefir is a smooth, tart, refreshing cousin of yogurt, often thought of as the “Champagne of Dairy.” Originating in Eastern Europe over 2000 years ago, kefir’s probiotic cultures have long been enhancing feelings of well-being. Lifeway Kefir contains 12 live and active Probiotic cultures that support the immune system and balance digestive health. It is naturally Gluten Free, 99% Lactose Free and contains No Artificial Sweeteners and is rich in Calcium. Lifeway also only uses milk that comes from cows that are not treated with pesticides, antibiotics, or synthetic growth hormones. The cows are grass fed and GMO free. If given the opportunity, one of my twins would drink milk all day. His healthy choice was to replace his morning glass of milk with a Lifeway Kefir Smoothie, it works great for him and one he dearly loves! His twin is a self proclaimed vegetarian. I make certain he gets the protein he needs through other avenues as meat is not a part of his diet. Since I have added Lifeway Kefir Smoothies, I know he is getting 11 grams of protein in each cup. Win-win! He loves the smoothies just the way they are. He also likes to add frozen pureed fruit for an extra chill and burst of fruit. My oldest chose to replace his favorite cereal (which contains too much sugar) with steel cut oats for breakfast. While he ate them occasionally, he enjoys eating them more often, especially now that he can change the taste easily. He adds a drizzled of honey, Lifeway Kefir Smoothie instead of milk and tops with fresh fruit for a #KefirCreations breakfast. My youngest twin and I went to Winn Dixie to purchase Lifeway Kefir Smoothies for this #CollectiveBias #shop. Before we left, I visited here to sign up for great money saving coupons of Lifeway foods. I'm so looking forward to the frozen kefir! 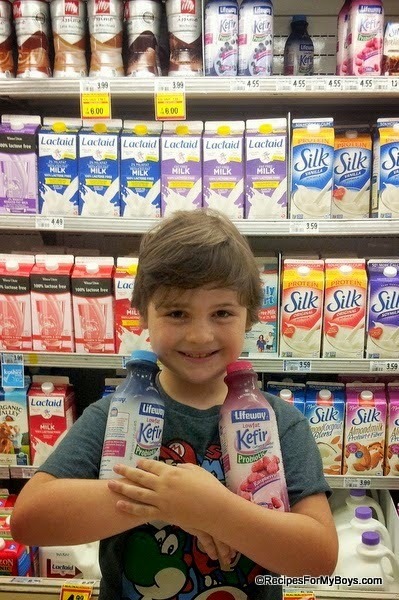 We found Lifeway Kefir Smoothies in the milk, including alternatives to milk, section of our local Winn Dixie. Our store had Blueberry, Raspberry and Strawberry, the day we shopped, in big 32 oz. bottles, it's a great size for our family. Can you tell how excited my son was to find his favorite flavors?! While we shopping, I picked up BOGO lunch meat, salad and spinach for our lunch. I also purchased a cold/heat bag to keep groceries cool on the ride home. A great spur of the moment buy since we had to make an unexpected stop on the way home. Everything was nice and cool when we finally got home. I am feeling very excited with the choices we have been, and are continually, making becoming healthier as we celebrate each day we are given. It is like a smile from the inside out. Now, it's your turn. Go ahead and give Lifeway Kefir Smoothies a try for a delicious and healthy breakfast, snack and as an amazing ingredient to enhance your dishes and desserts. What is your favorite way to incorporate these delicious Kefir Smoothies in your daily diet?